Many readers of the European and American press must be confused about what actually is happening in the negotiations between Greece (Alexis Tsipras and Yannis Varoufakis). The European Troika (the IMF, European Central Bank and European Council now object to the name and want to be called simply “the Institutions”) have stepped up their demands on Syriza. What is called “negotiation” is in reality a demand for total surrender. The Troika’s demand is to force Syriza to go back on the campaign promises that it made to voters who replaced the old right-wing Pasok (“socialist”) and Conservative New Democracy coalition, or else simply apply the austerity program to which that coalition had agreed:cutbacks in pensions, deeper austerity, more privatization selloffs, and a tax shift off business onto labor. In short, economic suicide. Last weekend a group of us met in Delphi to discuss and draft the following Declaration of Support for Greece against the neoliberal Institutions. It is now clear that finance is the new mode of warfare. The creditors’ objective is the same as military conquest: they want the land, the natural resource rights and monopolies, and they want tribute (in this case, debt service). And they don’t want sovereign Greece to tax the economic rent from these assets. In short, the negotiation between The Institutions and Greece is a bold exercise in rent extraction. What is not recognized is howsuccessful the Syriza negotiating strategy has been. While most voters opposed austerity, they also initially (and still) have a fear from withdrawing from the eurozone. Tsiparas and Varoufakis have walked a fine line and accurately judged unyielding and totalitarian the Institutions’ “hard money” creditor approach would be. The eurozone’s rejection of what obviously is an attempt at reason has greatly strengthened Syriza’s hand to say “NO” to deeper austerity. It would bring yet more unemployment, yet more emigration, yet more bankruptcy – and deeper distress prices for the public domain that the Institutions are insisting be sold off. On the surface, Syriza’s non-payment of the debt that earlier coalitions ran up (largely by not taxing the oligarchs who supported them) need not cause a great disturbance in financial markets. After all, the debts to which Greece objects are those run up to the IMF and ECB, not private bondholders. Yet the eurozone may turn this non-economic crisis into a political crisis by following through on its threat to exclude Greece from the eurozone. Current conditions are such that much larger numbers of Greeks may now support this position than was the case last January. At stake is much more than Greece itself. What the attendees at Delphi want is to rescue not only the Greek economy, but all Europe — by replacing the euro and the ECB with a less austerity-based monetary ideology. If they are driven out of the eurozone, they will be able to create a real central bank (via the Treasury) to monetize deficit spending to revive the economy. It is clear that what is needed is to replace the IMF with an institution able to assess the ability to pay debts, and to write down bad debts accordingly. Such an institution would replace Chicago School austerity and fiscal policy with a more progressive monetary and tax policy. If the European Central Bank follows through on its threat to wreck the Greek banking system, Syriza has put itself in a position to replace the oligarchs’ banks with a public option. 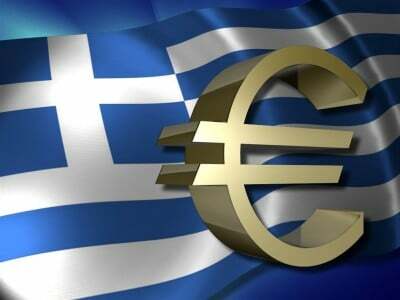 In sum, followers of recent news reports should bear in mind that despite all the statements of good faith that Greece “wants to pay its debts,” the reality is that there is no money to do so – except to the extent that the IMF may “extend and pretend” the charade by advancing Greece the IMF’s own money to pay. As matters have turned out, Tsipras and Varoufakis have not paid foreign debts with Greek money. They have not balanced the Greek budget by cutting back pensions, nor have they sold off the crown jewels of publicly owned infrastructure that European banks hoped to finance to their clients. Instead of selling out, Tsipras has given Greeks enough time to pull out their savings from the banks and convert them into euro notes (domestic circulation of which has risen by 13 billion euros), or into “hard” assets such as cars (or even boats) with a resale value. The above declaration was adopted by nearly all participants in the Delphi conference on the crisis, on alternatives to euroliberalism and EU/Russia relations, held at Delphi, Greece on 20-21st of June. It is also supported by some people who were not able to be present. The list of people who signed it follows [see complete version on GR]. In it there are not only citizens of EU countries, but also of Switzerland, USA, Russia and India. Many distinguished American scholars seem to be more sensitive as regard the European crisis, than the … political leaders of EU themselves! As for Russians, it is only normal and natural to bear a great interest for what is going on in EU, as EU citizens bear also an interest for what is going on in Russia. All participants in the Delphi conference share the strong conviction that Russia is an integral part of Europe, that there is a strong interconnection between what happens in EU and in Russia. They are categorically opposed to anti-Russia hysteria, which in fact is nothing less than the preparation of a new, even more dangerous cold, if not hot war.